We’ve all heard of exciting new technologies in the data warehouse world—tools like Amazon Redshift, Google BigQuery, and more recently Azure SQL Data Warehouse. What would you call this category of tools? Well, of course, “cloud data warehouse.” Check out the Google Trends graph for this search term. Explosive growth. The red graph represents searches for “Amazon Redshift,” compared to “cloud data warehouse.” It is growing much more rapidly, and appears many times larger, than the category it represents. Ha, you might be thinking, “they must be searching for other things, maybe ‘data warehouse on the cloud.’” As someone who has done several rounds of market research in this field, I can tell you assertively there are no larger search terms that describe the category. In fact, the category does not exist. I know it sounds funny to say the cloud data warehouse category doesn’t exist. After all the market is hot, tools are popular and growing rapidly. But the fact is—what comes to people’s minds is the tools, the brands; not the category. But wait a minute. Data warehouses have been around for ages. As far back as the 19th century Thomas Edison stored the results of his electricity experiments in a (legacy) data warehouse, installed on the highly scalable Kinetoscope Platform in his Menlo Park laboratory. Yes there are. They’re declining. But look at the comparison between “data warehouse” in blue and “amazon redshift” in red. 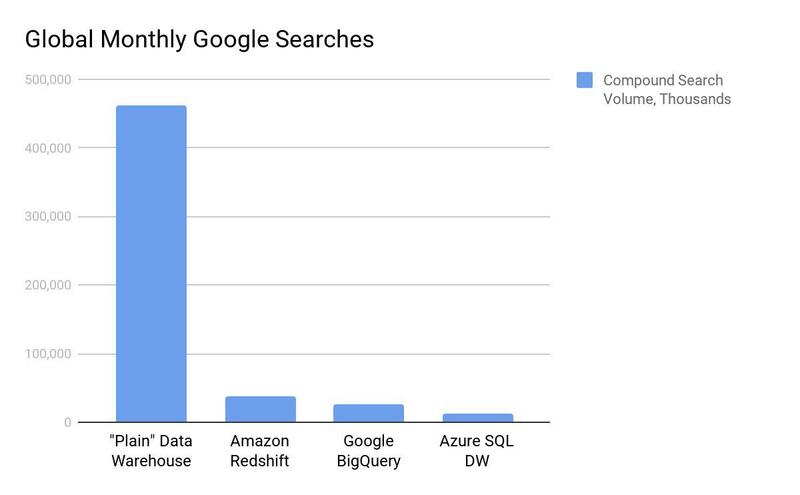 Redshift’s 14,800 are a drop in the ocean compared to “data warehouse.” That term alone is searched 90,500 times per month globally, and there are many other related search terms. “Data warehouse” is huge. Let show you another data point. I went through the laborious exercise of gathering all the possible search terms people have used recently, around “plain” data warehouse, vs. the three leading cloud data warehouses (Hey I used that phrase! That’s 301 mentions worldwide). We’re not just talking about the brand name “Amazon Redshift” or “BigQuery” but any possible combination – what is Redshift, Redshift architecture, Redshift clusters, etc. Excluding Redshift the cosmological phenomenon of course. In words: every month there are around a half a million people, probably wannabe data engineers, expressing interest in “data warehouse” or any variation of that. Compared to 38,000 searching for Redshift, 26,700 for BigQuery, and a measly 13,000 for Microsoft’s SQL Data Warehouse. 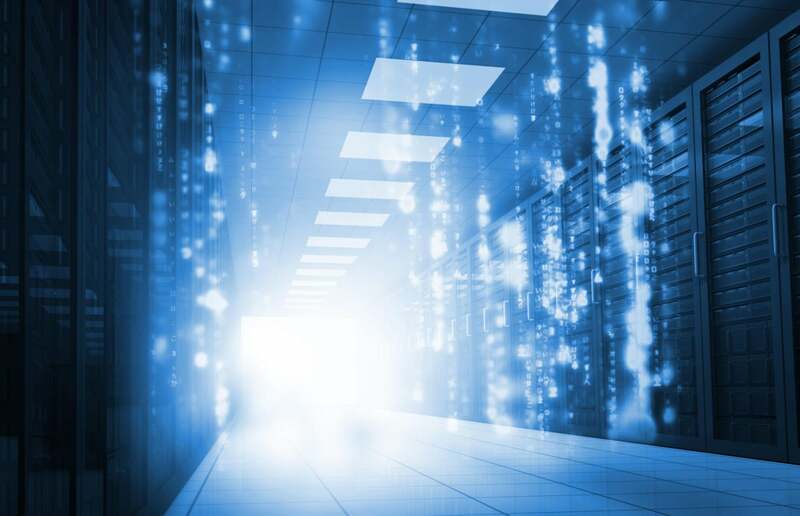 Hundreds of thousands of people search for “data warehouse.” They are only now making their first steps in the data warehouse world. They want to learn basic things like what data warehouses are for, how they work, how much they cost. But their eyes are closed to the truth of cool new products and architectures. Wow. That’s miles away from shiny technology from Amazon and friends—see diagram #2. Those half a million people will never (well, not really, but please allow me some dramatic effect) see diagram #2. They’ll see diagram #1 and move on to read about solutions like Oracle and Teradata. Not to knock those products, they’re great. But how many of this audience could be interested in the new generation of tools on the cloud with unlimited scalability and blazing fast query speeds? Does that make sense to you? Let me know in the comments. IMHO there is a huge missed opportunity here, a market education gap that none of the big players has noticed or seems to care about. Hundreds of thousands who are lost in Thomas Edison Land with little chance of graduating to the new and cool. This creates a lot of room for smaller players, such as Snowflake, which is going head to head with the big players, and Panoply’s self-optimizing data warehouse, which differentiates itself by making data ingestion, preparation, and query optimization much easier (disclaimer: I am an advisor for Panoply). They can, and will, use this opportunity to grab market share from the unsexy “old guard.” Instead of fighting very hard to grab it from Amazon, Google, and Microsoft. Gilad David Maayan is a technology writer who helps leading technology brands elucidate their technology to new audiences. He is also CEO and founder of Agile SEO which brings together developers, IT leadership and relevant content via the search engines.